FoFNL has been asked by ScotRail's Tourism Manager to help identify sections of the Far North Line that we believe would benefit from vegetation clearance for tourist/visitor purposes. This is to improve views from the train of particularly scenic areas, rather than necessarily improving operational performance (which is already part of scheduled maintenance on an ongoing basis by our colleagues at Network Rail). He says, "We carried out a similar exercise a few years back but I am keen to ensure we have updated records and are prioritising the right sections. We will only be able to carry out a limited amount of vegetation clearance so it is essential we focus on the sections which will give the greatest benefit. "Ideally if you could identify the geographic area/section, roughly how long it is, and whether the vegetation needs to be cleared on one or both sides (and if one side, which side), we will then compare this info with Network Rail’s data to identify a schedule of works. "Please note I am also looking at other scenic lines, such as the West Highland and Kyle Lines, and that we only have a limited budget and timescale. Therefore, I cannot guarantee we will be able to carry out the work in the current financial year, but the info supplied will help us develop a priority list for the works. "If you are able to identify 1 or 2 short sections quite quickly (say by the end of April) then we can try and get to work on those quite quickly, and add other sections at a later date once you’ve had the opportunity to consider and review in more detail." Please email us with any thoughts. We had been hoping to make an announcement about the planned works for the Far North Line in CP6 after the Rail: North of the Border conference on 26 March. It is looking as though the new 'pipeline' process, by which projects are fed into the workstream more or less continually, as they are agreed, rather than being decided upon in five-year inflexible blocks means that information is not released until each planned work is finalised. This makes good sense as a way of working, but from our point of view prolongs the agony of expectation. I should stress that we have no reason whatsoever to be pessimistic but the opportunity for a resounding fanfare on 27 March would have been nice! 2019 is the 25th anniversary of the formation of FoFNL. To mark this we have introduced the option of Life Membership of the Friends costing £120, with a special reduced rate of £100 if you become a life member by 31 October 2019. Why not become a life member now, guaranteeing that you will receive our three magazines each year and won't have to remember to renew your subscription ever again? Download and print out our membership form from here. At the Rail: North of the Border Conference 2019, which is being held in Glasgow on Tuesday 26 March, it is expected that Network Rail's infrastructure projects for Control Period 6 will be announced. Any news about the Far North Line will be posted here. Last week was excellent, with a PPM of 95% and only one train more than 5 mins late at 7 mins. Performance on the Far North Line has been patchy in recent weeks, although much better than last autumn when ScotRail was in the midst of the crew-training disaster. FoFNL has some excellent news on the staffing front: we have been told by ScotRail of a change in recruitment policy to address the recurring problem of train cancellations due to "crew shortage". It is now their intention to recruit sufficient train crew so that 'rest day working' is no longer relied upon to provide scheduled services. As it takes around 18 months to train drivers from scratch this is not an instant solution. For conductors we understand that it takes about 8-12 weeks. FoFNL members received their copy of our January magazine last week. If you're reading this, but not a member, please think about joining. We need to encourage younger people to join so that our work will be continued long into the future. Also, you would already have your copy to read! We've taken the unusual step of publishing an article online now [see next item below] before the full January edition goes online next month. HIGHLAND MAIN LINE - URGENT! Although FoFNL is the campaign group for improvements to the Far North Line, we are also very aware of the terrible shortcomings of the two lines that feed in from the south. Although some very welcome work is being done on the busy Inverness to Aberdeen route the Highland Main Line, from Perth to Inverness is in dire need of extensive upgrading to achieve even the modest improvements promised for 2012 by Alex Salmond in 2008. The enhancements being carried out at the moment are tiny compared to what's required. Our current magazine carries a detailed article by Richard Ardern which should be a 'must-read' for all Scottish politicians. Tim's Travels - FNL Video! We were recently approached by Tim Shearer, an Orkney resident, who has a YouTube channel devoted to his various travels. He told us that on 30 November he made a trip from Thurso to Inverness. His video is fun to watch and gives an interesting view of the journey, including a lot of shots of train interior details. On the day Tim made the video he had dirty train windows to contend with. When you're actually on the train you notice that much less, although it's far better if they're clean! Tim is at pains to point out that he is not a professional film maker - this is a hobby. I think this makes it all the more fun to watch! On a serious note - we often refer to the fact that the real terminus of the Far North Line is Orkney, and the video is a reminder that the FNL is a great way to travel to and from there. Please Write to Your MSPs! Having started the process of asking all MSPs to think very carefully about Network Rail Scotland Route being owned by (effectively), and answerable to, the UK Government instead of the Scottish Government, we are hoping that as many people as possible will take the time to write in support of devolving NR Scotland Route. Each of us in Scotland has eight MSPs that we can write to as individuals - seven Regional 'List' MSPs and our constituency MSP. Please help to get this message across as soon as possible by writing to (preferably) all of your eight MSPs. If you want to check who they are, and how to contact them, use this tool. We received the good news today (8 December) that the remaining broken connection at Inverness, the 16:00 ex-Wick, will be restored with the (retimed) 20:16 to Glasgow from the May timetable. Although this doesn't help for the next five months, it's good to know that work was done to fix it. Meanwhile, the lost call at Beauly on the 18:31 INV-WCK unfortunately cannot be fixed until December 2019 when the revised HML timetable comes into effect. On 6 December this letter was sent to all MSPs to draw their attention to the problems caused to Scotland's railways by Network Rail Scotland Route being part of a GB operation, rather than being devolved to the Scottish Government. We emphasised that this is not a political question (although Westminster appears to consider it such) but a practical matter and therefore should attract cross-party support. Well, mostly! We discovered on 30 October that there were many broken connections to/from the FNL at Inverness in the December 2018 timetable. Some rapid communication with ScotRail followed in which they kept us fully in the loop about what had happened and what was being done to fix it. Timetabling is done centrally by Network Rail who work with with the Train Operating Companies, such as ScotRail and the freight operators. The broken connections were going to affect many passengers on the FNL, in some cases having to postpone their journeys to the following morning as connections into southbound evening trains were lost. One such problem could not be solved - the 16:00 Mondays-Fridays WCK-INV service will arrive in Inverness at 20:13 and the Glasgow train will depart at 20:15, the booking system will not sell tickets using that as a 'connection'. The other unavoidable side-effect of the fixes is that the Beauly stop on the 18:31 INV-WCK is being omitted for the time being - this was seen as the "least worst" option. Praise is due to all involved for working quickly to make the best compromises possible. FoFNL, however, is of the view that had Network Rail Scotland Route been devolved to Scotland, and therefore timetabling handled here, this crisis would probably not have arisen. The September newsletter has been online for a while now. Read about matters relevant to the Far North Line and its southern neighbours as well as cruise ships, potatoes and a railway that was never built. 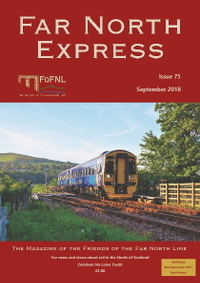 As always this is where I mention that if you were a member you would have received this edition of Far North Express in September and not have had to wait a few weeks until it's published here. In any case, a hard copy of the magazine is always better than the online version! Plus by joining you would be helping to strengthen our arguments even more for the work that needs to be done on the line. After a few terrible weeks last week's performance figures were much better. Unfortunately a lorry driver wrecked Wednesday's services by trying to get under the low bridge in Shore Street in Inverness. We assume that Network Rail will be putting in a huge claim against the lorry's owner, PJH, suppliers of bathrooms, kitchens and appliances whose ironic strapline is “Together we're better”! Had that not happened the figures would have been much nearer to what they should be. FoFNL is not convinced that Control decisions are as fully informed, or geographically aware, as they need to be. I wonder why the 10.57 to Kyle did not go out coupled to the 10.41 to Wick as far as Dingwall? Both were delayed until the 06.18 from Wick got in 26 late at 11.01. With a Lentran Loop a crossing of the incoming and outgoing Wickers could have been achieved. 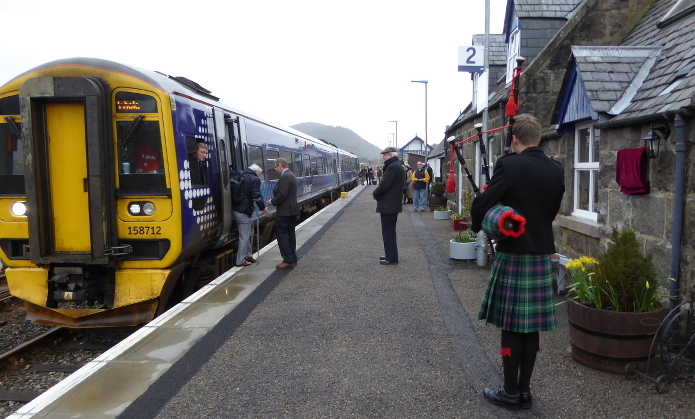 The 10.41 was still 22 late at Helmsdale but had to wait there another 47 minutes for the 12.34 southbound. It left 69 late and by missing out Thurso arr Wick 44 late at 15.40. It missed its 16.00 return slot and left 23 late, but by missing out Thurso again regained schedule for the rest of the journey. This was all caused by an 11 min delay between Tain and Lairg for the 07.00 Inverness-Wick. The 06.18’s consequent 11 min down became 26 min by Inverness. It caused havoc on the Kyle Line too which resulted in the 14.50 Invernet to Invergordon and return being cancelled. The problem now for the Government is that money is getting ever tighter and other claims such as replacing vessels for Caledonian MacBrayne are also getting more urgent. This is compounded by the denial of geography which is affecting HM Treasury this year and resulting in them allocating railway monies on a crude per capita basis rather than, as hitherto, by need. Scotland’s railways have been denied some £400M through this. The Far North Review Team, which was set up by Fergus Ewing (Cabinet Secretary for Rural Economy) in December 2016 to discuss all aspects of the Far North Line, met on 7 September to discuss a summary of progress to date and the next steps for implementing future plans. Discussions covered line capacity and speed enhancements, signalling, train improvements and timetable structure. Network Rail and ScotRail are working hard with Transport Scotland on this raft of improvements to the Far North Line, some incremental and some radical. The fruits of the discussions cannot be shared yet, as announcements will be made in due course. Suffice to say that Mike Lunan and Ian Budd from FoFNL came away smiling broadly! The writers of the report, former UK Transport Minister Tom Harris and Mark Diffley Consultancy and Research, employed ScotPulse to conduct a survey of 1,063 people, the results of which are central to the report. 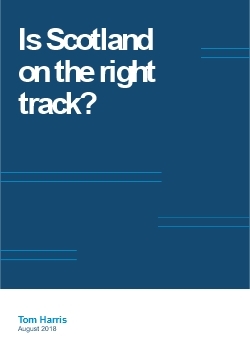 It's well worth having a look through this; the section about the current situation of Network Rail, in relation to the rest of the railway provision in Scotland is particularly interesting. The majority of those surveyed would like to see Network Rail Scotland Route, which is currently simply a division of Network Rail, and therefore under the ultimate control of the Department for Transport, devolved to the Scottish Government, which already pays it for its work in Scotland. You get to travel on two of Scotland's most scenic railways, plus a visit to Skye! This allows four travel days, with unlimited breaks in journeys, the whole circle to be completed within eight days. The cost is £89 and normal Standard National Railcard discounts apply, EXCEPT for the Glasgow or Edinburgh Days Out travel pass. There's a 50% discount for children aged 5-15 and under fives travel free. You can start and finish the tour at any point on the route. Although you are free to travel almost whenever you wish, you must stick to one direction once you have begun your trip. The only time restriction is that journeys on the Highland Main Line and Glasgow-Edinburgh must commence after 09:15. This is also what railways are for! FoFNL campaigns for all use of the Far North Line. Subsea 7 (see article in last January's magazine) is having pipes delivered this summer to Georgemas Junction, where they are transferred to lorries for the last few miles of their journey. This kind of scene would be common on railways if politicians would follow up on policy pledges and work harder to encourage the shift of freight onto rail. This will require some infrastructure work on the FNL, e.g. the Oykel Viaduct has a weight limit which needs to be increased. Currently, because the line is single track throughout with very few, and often too short, passing places, there is a shortage of available paths for freight trains. The only people who think it is better to transport freight by road are those who make money from doing so. The UK and Scottish roads and haulage lobbies are wealthy and presumably have much influence politically. There is no other explanation for the counter-intuitive preference for transporting freight by road. Obviously there will still need to be road vehicles to move goods from railheads to destination. A classic example of this in practice was the Safeway trains of some years ago. It's hard to understand why Morrison's did not continue those trains. Perhaps it is that in this country cheapness trumps every other consideration. Yet that is why we have politicians - to do what's best in every way. On 23rd May the first consignment of pipes for the Subsea 7 fabrication plant near Wick ran from Hartlepool to Georgemas Junction. Here is a video of the train leaving Brora. After a Press Release from FoFNL expressing hope that Virgin Trains East Coast and/or their successors LNER will help to ensure that passengers travelling down to Inverness on the ScotRail 06:14 from Ardgay, which provides a 12 minute connection into the 07:55 Highland Chieftain to Kings Cross, this article appeared in the Press & Journal on 25 May. Passenger perception, we hear, is that people from Ardgay southwards intending to travel on the Highland Chieftain don't really trust the Far North Line service. 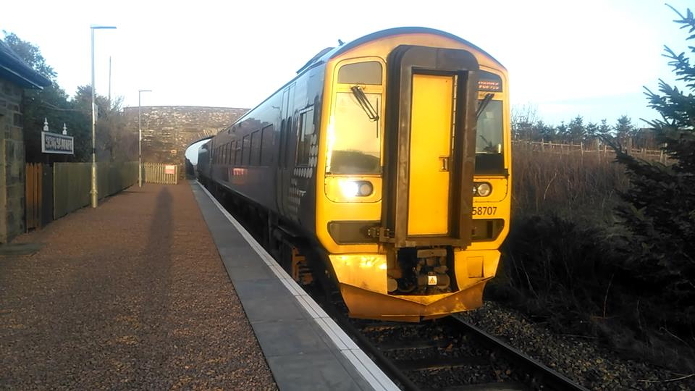 Knowing that VTEC will not hold the train to allow a connection when the FNL train is late many resort to other means to get to Inverness. An assurance from VTEC/LNER that will promise to hold the train for five minutes would be very welcome. However, we've had a look at this year's record for the 06:14 ex Ardgay. We found that of 120 runs, two were cancelled and three were more than 2 mins late. Only two would have missed the connection completely. It's a shame that the FNL's poor record for timekeeping is now stuck in travellers' minds, even though it is now miles better. If you know anyone who is not using the FNL because of this please let them know that things have improved dramatically. This piece by John Finnie MSP appeared in the Inverness Courier on 4th May and is reproduced with permission. Last week while down in the Central Belt as part of my normal working week, I took the opportunity to nip along to Coatbridge and visit the Freightliner Rail Freight terminal. A single freight train can carry enough material to build 30 houses and while it's good to see the likes of Tesco and Diageo utilising rail to carry goods to and from the north, many businesses are missing out on opportunities to switch from road to rail, simply because the single track Highland Main Line simply does not have the capacity to cope with any significant increase in freight traffic. Those who regularly travel to the Central Belt by train will understand the potential for major disruption to journeys as a result of extremely limited capacity. While I am pleased that the Scottish Government has recently announced a modest £10 million investment to improve the Highland Main Line, I fear it will amount to little more than tinkering, rather than the serious improvements that are needed. Time and again we see major investment in trunk roads, with billions splashed on projects which continue to prioritise the motor car. The government trumpets City Deal projects, which are all too often just glamorously titled road building schemes. I cannot imagine a project that would be more transformative for the Highlands than the dualling of the Highland Main Line. Every tonne transferred by rail, rather than road, cuts CO2 emissions by 76 per cent. Dualling the Highland Main Line would be of huge benefit to the climate and could take between 250 and 300 lorries a day off the A9, which would make our roads safer and reduce repair bills. Increasing capacity on the Highland Main Line would also offer exciting opportunities to greatly improve journey times between the Central Belt and the Highlands. I am confident this move would be widely welcomed, particularly by businesses who could engage with their counterparts in the Central Belt much more conveniently. The tourism sector is of course vital to the economy of the Highlands and Islands and ensuring that we have rail links fit for the 21st century would greatly improve the appeal, encouraging many more visitors to the north. Further improvements to the Far North and West Highland lines would enhance this further of course. But as the main rail route to and from the Highlands, we simply can't afford to continue waiting, we need to dual the Highland Main Line now! Although FoFNL doesn't actively campaign on railway matters outwith the Far North Line, this route is vital for passengers and freight travelling to the line. All MSPs should read this and THINK! 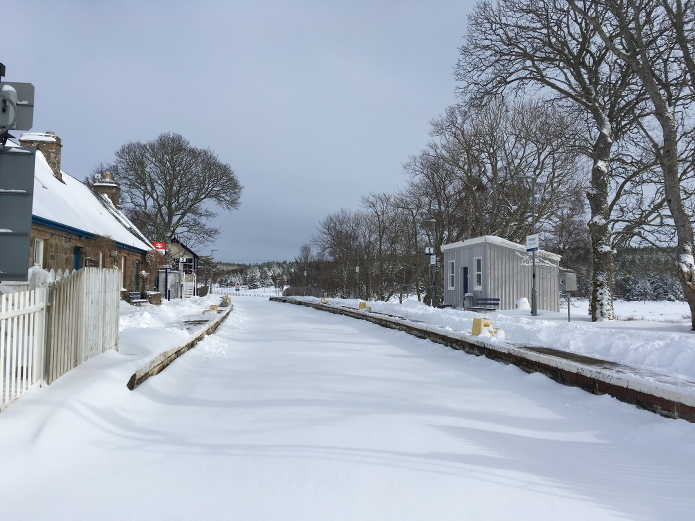 Brora and District Action Group, the village Development Trust, has just been given permission by ScotRail to brighten up the hoardings on Brora Station with some community inspired artwork. The members are currently developing ideas and gathering funding for this project. This is in addition to the ongoing improvements they are carrying out to the planted areas of the station, with a delivery of additional planters expected in May. You can visit the BaDAG Website to find out more about the group. 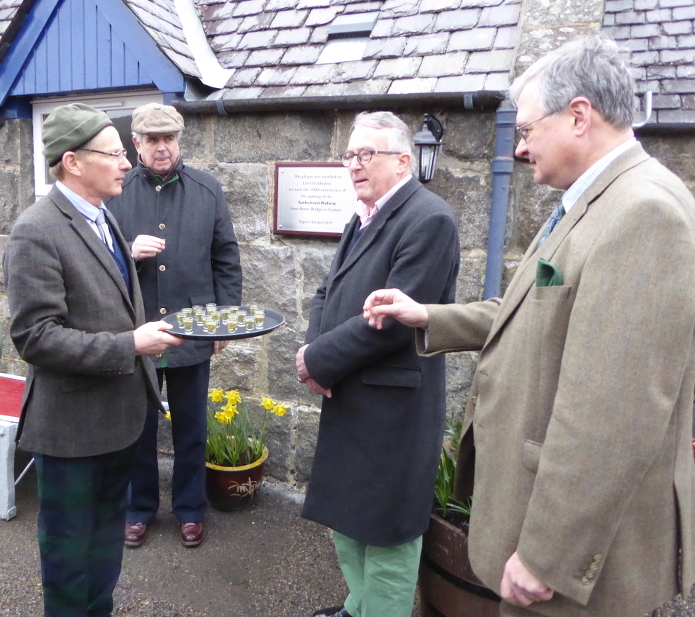 At a ceremony on Friday 13th April 2018, organised by FoFNL member Frank Roach, a plaque to commemorate the 150th anniversary of the opening of the Sutherland Railway (part of the Far North Line) from Bonar Bridge (now Ardgay) to Golspie, was unveiled by Lord Strathnaver. 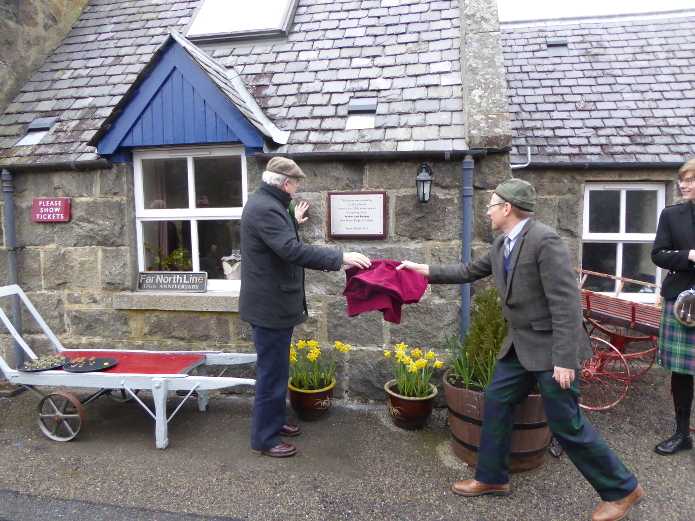 Frank Roach assists Lord Strathnaver with the unveiling. Frank Roach, Lord Strathnaver, Jamie Stone MP, FoFNL President and Bill Reeve, Director of Rail , Transport Scotland, after the unveiling. It was another six years before the line reached Thurso and Wick with huge financial help from the Duke of Sutherland. Friday 13th April 2018 marked the 150th anniversary of the opening of a significant stretch of the Far North Line from Bonar Bridge (now known as Ardgay) to Golspie. This section of the line was authorized on June 29th 1865 (from Bonar Bridge to Brora). 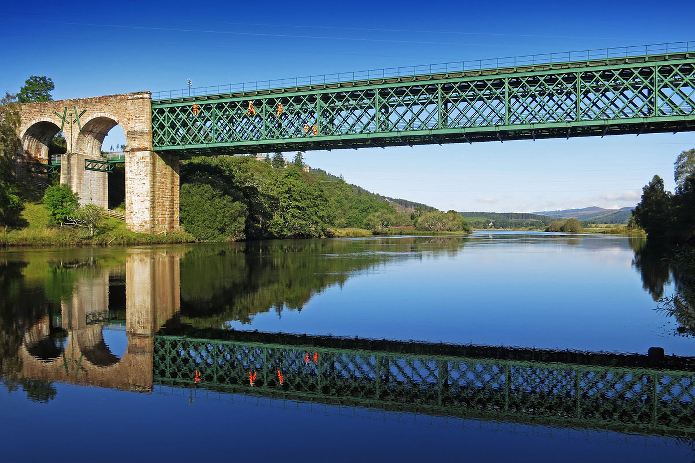 It was a very expensive project with major engineering challenges, including the bridge over the Kyle of Sutherland, the Oykel Viaduct, and rock cuttings near Lairg. 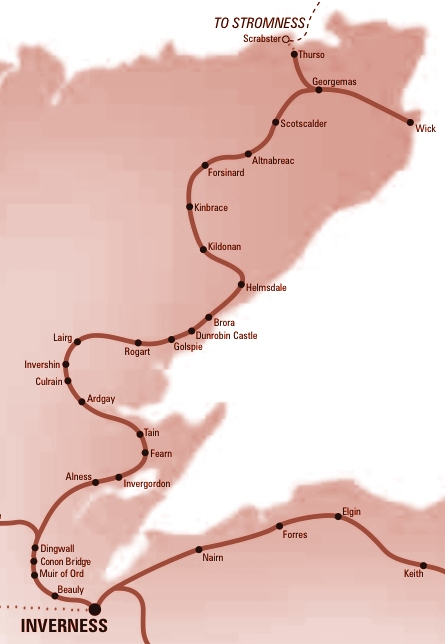 The new railway as far as Golspie opened on April 13th 1868 and was 26 miles long. In spite of £15,000 of assistance from the Highland Railway the promoters of the Sutherland Railway couldn't afford to continue the line any further. A new Act of Parliament was passed on June 20th 1870 which transferred the powers to build the remaining 6 miles, and gave powers for the extension to Helmsdale. The Duke of Sutherland took over construction, and services, provided by the Highland Railway, commenced on June 19th 1871. 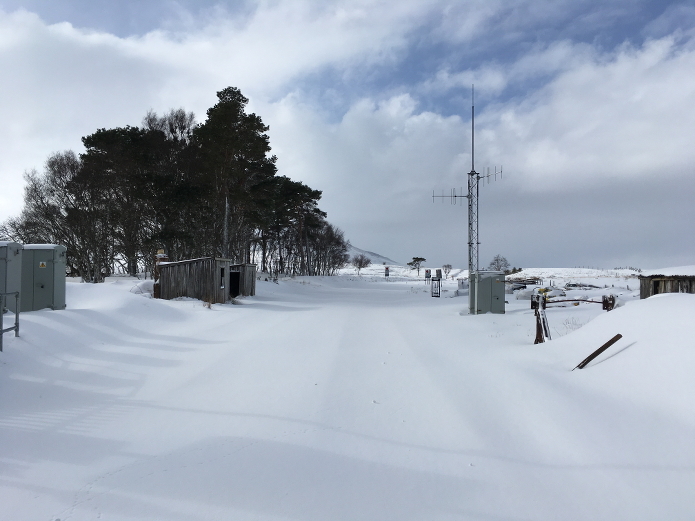 The final section of the Far North Line to Thurso and Wick opened on July 28th 1874.
or 'Frozenhard' as someone responsible for FNL snow clearing used to call it! The very heavy snowfall which affected most of the UK last week made for some amazing pictures! These photos were taken by Jonathan Ford from the Flows To The Future Project based at RSPB Forsinard. The platforms have been made ready for passengers! Looking the other way. Ghostly image of hidden rails! The January newsletter has been online for a couple of weeks. 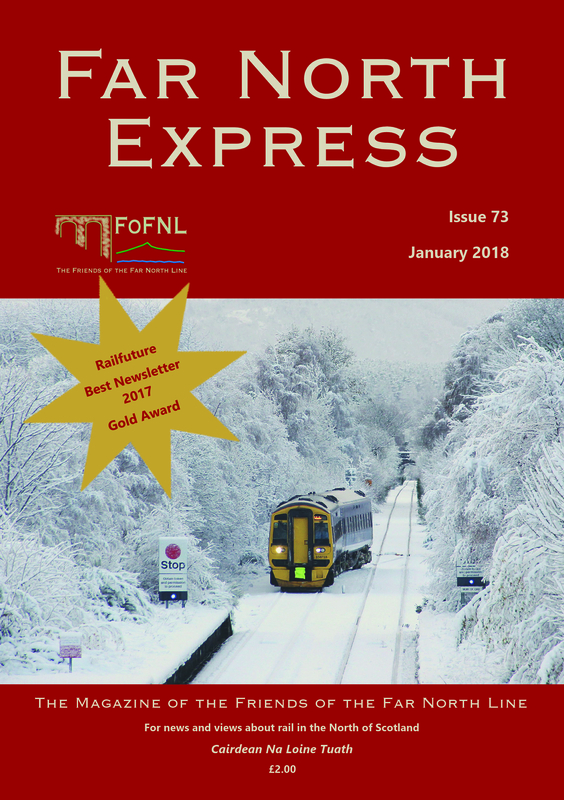 As always this is where I mention that if you were a member you would have received this edition of Far North Express in January and not have had to wait a few weeks until it's published here. In any case, a hard copy of the magazine is always better than the online version! Although FoFNL exists to campaign for improvement on the Far North Line, we obviously have very strong views about the lines south of Inverness. The following letter appeared today (26 Feb) in the Press & Journal. It encapsulates a fact that we frequently mention - for some reason it seems that although Scottish Government policy is to encourage the use of public transport, it can't stop itself from putting road building first. It is extraordinary that one of Scotland's cities should have all four railways that radiate from it being single-track with passing places. Imagine if all the roads were the same! Having just arrived in Inverness on the excellent overnight sleeper from London, it seems ironic that our train and its many passengers were held on two of the several passing loops - at Kincraig and Tomatin on the now mainly single-track section - awaiting southbound trains. 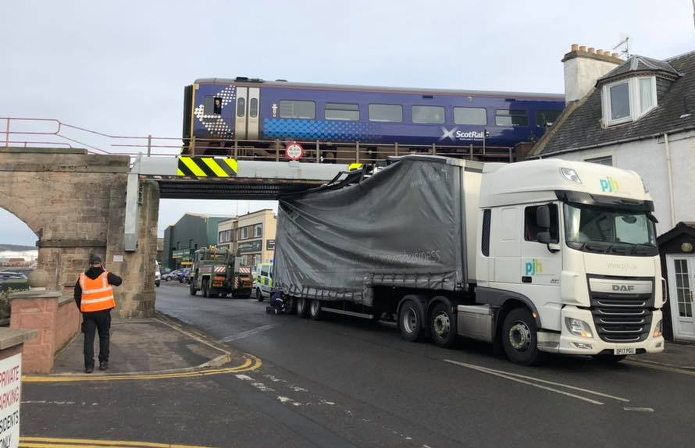 If many millions are going to be spent on dualling the A9, which will simply encourage more road traffic, surely a few million more could be spared to dual some of the railway to keep passengers and freight on the tracks. And a second track, where there's room, takes less space than a whole new two-lane carriageway. Things are really looking up on the Far North Line! Last week's punctuality figures were the best since our records began. Although the PPM figure, which is percentage arrivals within five minutes, was down slightly, it was still 94%; actual on-time or early figures were 93% northbound and 87.5% southbound. Bearing in mind that our first recorded figures, for the week beginning 31-10-2016, were PPM: 46.9%, northbound and southbound on time arrivals: 18% it is clear that huge improvements have been made. Last Friday two FoFNL representatives, Mike Lunan and Ian Budd, attended the FNL Review Team meeting. The RT was set up at the end of 2016, on the instruction of Fergus Ewing, Cabinet Secretary for the Rural Economy and Connectivity, to shine a light on the problems the FNL was experiencing. The team was to look at, and work out necessary action to remedy, the causes of existing problems along with developing plans to improve the service and the railway itself in the future. The doubling of permanent lineside staff to tackle the massive job of clearing overgrown vegetation and securing or replacing fences. This will provide 9 more jobs, of which 6 will be based at Helmsdale. A technical change to the signalling system which will allow much greater flexibility at the southern, busier, end of the route. Work being undertaken to increase the speed at which passing loops can be traversed. Work completed on level crossings which has also resulted in linespeed increases. It was reported by ScotRail that 2017 saw a 7% increase in FNL passenger usage. HITRANS is working on an electronic system to enable passengers wishing to board the train at a request stop to communicate their presence directly to the train. This will allow trains to pass through at a higher speed when there are no requests. Some of these improvements will make the present timings more realistic, thereby improving punctuality, and some will result in reduced journey times. Unfortunately the next timetable change, due in May, may not be able to reflect these improvements due to the lead time required by timetable planners, if not, they will appear in the December 2018 timetable. 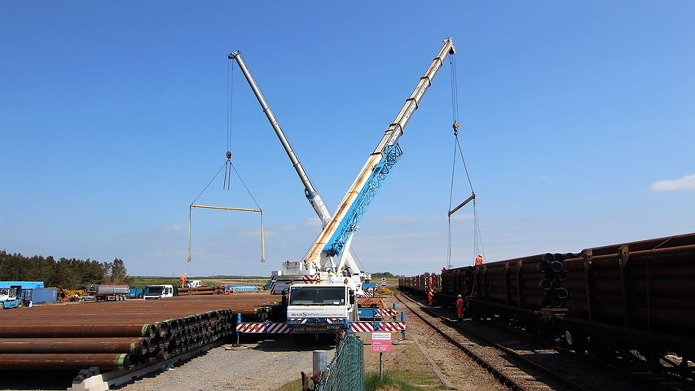 The RT's discussions about future enhancements feed into the CP6 'pipeline' process where decisions about the allocation of money between 2019 and 2024 are made. 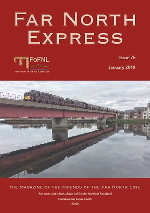 FoFNL is very optimistic that a passing loop will be added between Inverness and Dingwall in this period. I hope this conveys how strong Transport Scotland's support is for the FNL. They are spending a lot of effort and resources on improving it, which bodes well for its long-term future. Saw this picture today and really liked it! It was taken by Felix Saward who has a blog called Least Used Stations. He very kindly gave me permission to reproduce it here. At the Railfuture Conference in Leicester on 4 November our newsletter/magazine was given the RUG Best Newsletter 2017 Gold Award. We are one of many Rail User Groups in the UK so we were delighted to receive this recognition. Our newsletter contains articles and news about our campaign along with a mix of other items of interest, rail-related (loosely sometimes! ), often historical. Complementary copies go to a wide range of people such as MSPs and the press, as well as key people in the rail industry. 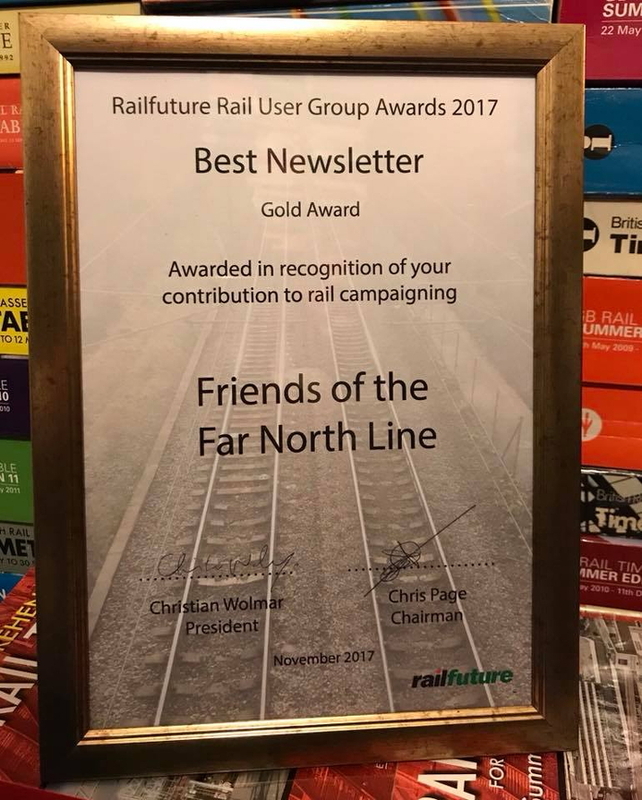 The award was presented by Christian Wolmar, Railfuture President, to Gavin Sinclair, FoFNL member and former secretary. We hope that the double track on the certificate is a subliminal reference to the Scottish Government's pending announcement about rail improvements to be carried out in CP6 (Control Period 6)! We would like to congratulate our colleagues at the Tarka Rail Association who also received a Gold Award. FoFNL now has a page on Facebook. We are hoping our page will stimulate interest in what we do and the Far North Line in general. Please have a look at our page, like it (if you do!) and share it with your friends. 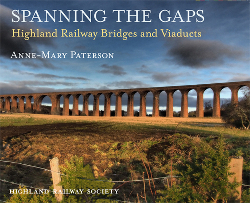 The Highland Railway Society has published a book about the rail bridges on the Highland Railway. Given the rugged terrain that it crossed the Highland Railway did not lack for remarkable bridges over the many water courses and defiles along its route. Anne-Mary Paterson once more gives us the benefit of her extensive knowledge and research to give an interesting and comprehensive overview of these structures many of which are still part of the fabric of the present system. The book is fully illustrated on glossy art paper and may be purchased at good bookshops for £16.00 or from the Society for £18.50 by post. It is available to members for £10.00 (or £12.50 by post). The Scottish Natural Heritage website used to carry some excellent audio guides to the Far North Line. They were in MP3 format and were ideal for listening to on the train. We now have them hosted on our site. If you are travelling along the Far North Line you might like to enhance your journey by downloading our guide, written by Richard Ardern, one of our committee members and very prolific article writer for Far North Express! The Guide is in .pdf format so you will be able to follow it on any smartphone or tablet. Highland Survivor, The Story of the Far North Line, wins Award! 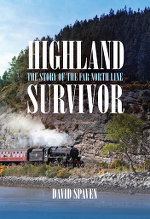 David Spaven's new book, Highland Survivor: the story of the Far North Line was launched on 21st September 2016 and has now won the 2017 Railway Book of the Year award from the Railway and Canal Historical Society. Would you have any member in Dingwall or Inverness who could work part time for our Charity selling Kyle Line maps @ £10 per hour. Daily 10-2? At the Rail Stakeholder Conference on 16 December Fergus Ewing, the Scottish Government's Cabinet Secretary for the Rural Economy and Connectivity, announced he has instructed Transport Scotland to set up a Review Team to look at the Far North Line in detail and come up with a suite of actions. The team consists of Abellio ScotRail, Network Rail, HITRANS and FoFNL. This is a major step towards achieving necessary improvements including the installation of the Lentran Loop. The Review Team's work is now in full swing. FoFNL has commissioned Tony Glazebrook of Aliona Ltd to carry out a detailed study of the Far North Line. Tony was given full access to the line during the first week of October, including a full-length journey in the cab of a service train, the best position to see the state of the infrastructure. Phil Verster, Managing Director of the ScotRail Alliance, ensured that Tony had full access to the railway and the operational staff. This enabled a comprehensive review of the difficulties the line has been experiencing. FoFNL Convener Mike Lunan commented, "FoFNL has made its views known to politicians and funders for many years: this Report will allow us to be more focused and evidence-based, and we record our gratitude to its author, Tony Glazebrook." If you're interested in golf, and if you're not, you'll find Scottish Golf by Train well worth a look. It is packed with information about over 400 Scottish golf courses with all the information you need to reach them by train. Can't help thinking that someone will want to attempt the complete collection! It is lamentable that you currently need to change onto a bus for the last five miles of your journey to the Home of Golf. Campaigners in St Andrews are working hard to rectify that. 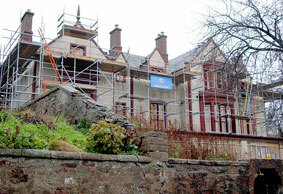 FoFNL has been asked to lend its support to a project to restore a large house in Inverness. The house was designed by and built for Joseph Mitchell who was a civil engineer and surveyor responsible for many Highland and Far North projects, including, on the Far North Line, Tain Station and the Oykel Viaduct. The proposal is to convert the house to flats and to include a small museum showing Joseph Mitchell's work. Have a look at the Highland Historic Buildings Trust for full details. Single track railway with passing loops = single track road with passing places (in the case of railways such as ours it is many miles between passing places - on the roads they are every few yards to avoid inconvenience). Double track railway = single carriageway road. Quadruple track railway (e.g. West Coast mainline out of London - rare in UK) = Dual Carriageway. In road terms the four rail routes out of Inverness are all single track roads with passing places apart from a 30 mile stretch of "single carriageway" north of Blair Atholl. Interesting that work has now begun on the Perth-Inverness section of the A9 to widen it to the rail equivalent of four tracks. The Friends of the Far North Line is the campaign group for rail north of Inverness, lobbying for improved services for local users, tourists and freight. Our website will give you an insight to FoFNL's successes and concerns. You will find a complete collection of newsletters dating back to 1998 as well as an archive of interesting documents. The continued retention and improvement of the line from Inverness to Wick/Thurso. The development of services for local residents and tourists alike. Publicising the line, its attractions and potential. Liaison with local groups to foster interest in the line. Liaison with ScotRail, statutory bodies and tourism authorities. The use of the line by heritage trains. Our 1995 conference for rail interests was the precursor of the Highland Rail Partnership a collaborative body spanning the Council, Highlands and Islands Enterprise, local Enterprise companies, rail operators, the Friends Groups and others. 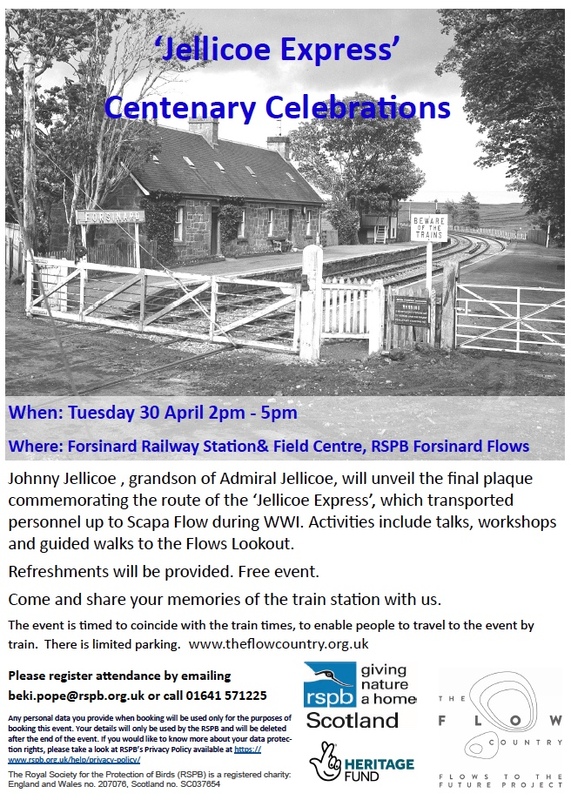 Achievements include the Easter Ross commuter train, Beauly and Conon Bridge stations, all-year Sunday trains, initiating the re-introduction of significant freight, the transporting of extremely long lengths of pipe to Wick, and the building of a footbridge alongside the Shin Viaduct. A substantial increase in freight is still needed and we will continue to persuade haulage contractors that there is an alternative to driving long distances over inadequate roads. We continue to seek shortened journey times and hourly services between Inverness and Tain. We aim to work in partnerships, we publish a thrice yearly Newsletter, we are democratically governed through our AGM and a geographically representative committee. If you would like to join The Friends of The Far North Line please download, print out and complete the application form. If you prefer, you can phone our Membership Secretary on +44 (0)1334 475311. Annual membership is only £15.00 (£12.00 if you set up a standing order) for individuals and £17.00 for corporate or organisation membership. The photo of Culrain station was taken by Peter Van Den Bossche and the photo of Altnabreac by Dennis Troughton. Both are used under the Creative Commons Licence.